Another novel with the same theme: the fear of youth ruling the earth; a huge power looming up to take over the world!! Etc. But still, I have to say I liked the novel. It was mostly due to the different approach to the same theme, and the character of Hilary Craven. I liked how the novel turned out to be something quite different from what I had expected (hint, it turned out not to be all about taking over the world!). Destination Unknown takes Hilary Craven, a disillusioned and heartbroken woman into the heart of a conspiracy. Tired and broken, she is given a chance to do something before ending her life. Traveling through unknown territory and barren deserts, will she be able to find herself along with the people she is sent to look for: a number of reputable young scientists who have mysteriously disappeared - gone behind the curtain? Will the conspiracy remain a mystery forever? Somehow, with Agatha Christie, one never thinks so. 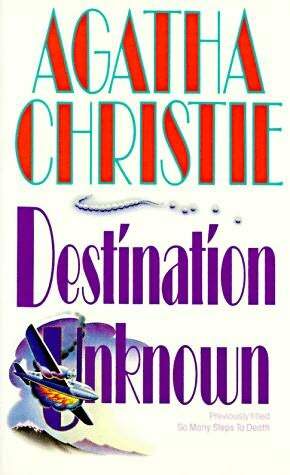 With the usual cast of intelligent and charming characters, I enjoyed reading Destination Unknown.